For more than a century, gardens were an important part of everyday life for officers, families, and prisoners confined to Alcatraz by sentence or duty. Many of the plants selected by these unheralded gardeners proved to be excellent choices for the harsh and barren environment, flourishing through the four decades of neglect that followed the prison’s closing. In 2003, the Garden Conservancy and the Golden Gate National Parks Conservancy formed a partnership with the National Park Service to restore and maintain key gardens on Alcatraz. 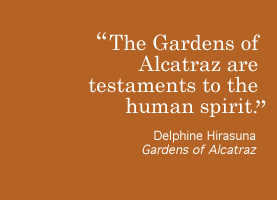 Through the Alcatraz Historic Gardens Project, the partner organizations preserve, rebuild, and maintain the gardens created by those who lived on the island during its military and prison eras, and interpret their history, horticulture, and cultural significance for visitors.